When I was a child my hips were open - dangerously open - and then sometime mid-adolescence they shut. I only noticed the depth of the change in my early twenties. My hips were shut to the extent that when I lay on my back with one leg straight and the other knee folded up and inward, my hip flexor just said 'Stop'. The beauty of the hip flexor is you have to listen. Then I got my hip flexibility back - fully - in my forties. It was in part a journey of mind which is a primary aspect of yoga. 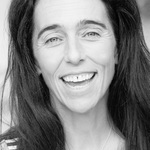 Some wonderful yoga teacher - and I really can't remember which one - taught me Vanda Scarivelli's hip-openers. Ever since I have been using them - and passing them on. Anecdote has it that Ms Scarivelli promised clients they would never have hip problems or a hip replacement if they practiced this sequence, daily and life-long. Vanda certainly lived well and had longevity and wisdom. Speaking then as someone who developed stiff hips early - and turned that around - regular practice of this sequence can definitely help release the pelvis. To start you will need a yoga belt and 30 minutes uninterrupted. That's 15 minutes each side. It is possible to go faster but this is a yin practice and benefit is derived from staying in each posture for longer than one or two minutes. I recommend always beginning any yoga in Sivasan (first pic below). For anyone who has forgotten Sivasan - or has taken to doing it in a rush - this is corpse pose and you are dead. Shoulders rolled open, hands relaxed, skeletal system dropping into the floor. Let's start on the right side. To begin with bend up your right leg and bring that knee close. You are loosely clasping the shin of the bent leg (image below). Your right hip flexor may be uncomfortable now and so breathe into that also. The other leg is long and the knee of the bent leg should be comfortable throughout. This is a posture of undoing. See if you can stay here. Relax completely. Next, transfer right leg fully into your right arm and allow the leg to fall open (see picture immediately below). This is a falling open with the knee bent and an awareness of your right hip. If you like you can place your left hand on your left hip bone to help anchor the other side. We all have a ball and socket joint at the hip bone and with these openers we are experiencing degrees of movement that may not regularly arise. If you feel as though surrounding tissues are stuck together - or any malaise at all - just be calm and breathe evenly. You will naturally be helped. Our bodies are always moving toward equilibrium. The next posture is subtle. It may take a little time to get. The visual change from the photograph above to the one below is small but the felt difference is vast. Now bring yourself into a keyhole stretch (in pic as follows). To do this you bend up the left leg placing the left foot on the ground. Then you take the right ankle and place it on the left thigh above and close to the knee. Make sure your yoga belt is within arm's reach as you do this. Lift the left leg off the floor maintaining the legs and so reach through with both arms to either encircle the left shin or the back of the left thigh. Keep it manageable. This is also a beautiful posture for people who cycle or run regularly. Take your yoga belt and make sure you have a small loop. Stay in keyhole stretch as you do this. Slip the loop over the top of the right foot and lightly hold your yoga belt in one or both hands. Release the left leg straight down along the ground and keep the right foot looped and exactly where it was on the left leg. 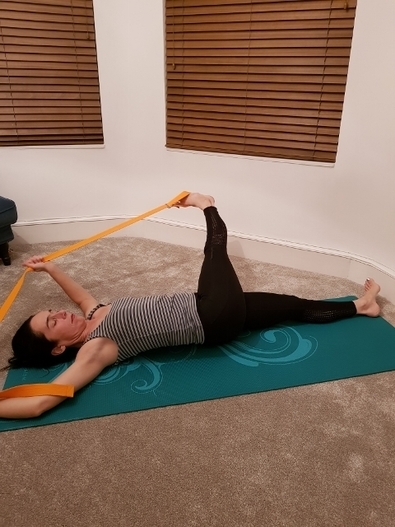 Then you have a dropped bent right leg which would fall off the left leg completely if you were not keeping it in place using the pull of the strap. You also have a yoga strap held gently (illustration below). What is to be experienced here - and accentuated - is the feeling of the top of the femur moving down in the ball and socket joint of the hip. All harmonious joint rotation potentially increases lubrication which helps fluidate the body . When you do get this - and - everyone will - there is a moment of real discovery. Now the postures become more outwardly dramatic. Enjoy the sweep of it but don't lose your feel. Keep the right foot looped and extend it toward the sky. Let the left leg remain where it is on the ground and feel the juxtaposition. If you can, straighten the right knee. Allow the belt to be friendly. Once your leg has begun to accept the stretch, draw your right leg toward your head and breathe (as shown in immediate picture below). Have your strap now in your right hand only and let the leg in the air open to the right (shown underneath). This is a large, end-of-range move and if the knee is uncomfortable at all, soften it. Now definitely soften your knee and bring the leg back. Place your strap in your left hand and take your leg over to the left (as below). This can be very strong posture-wise and it is fine to have a bent knee or do an approximation of the pose. Again, stay here and breathe. Finally, soften the right knee once more and return to that position where the right leg was straight up in the air. Walk your hands all the way to the furthest end of the strap and with your hands and arms overhead let the leg follow. You have nearly completed side one and this is it. 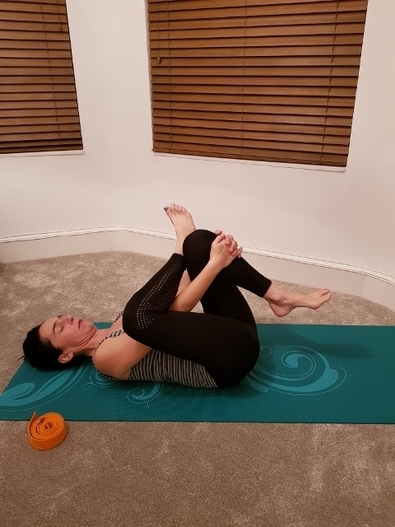 Breathe lovingly into your right hamstring (below). Having liberated your hamstring - a little or a lot - you can draw that right knee lovingly into your chest. Also remove the strap and notice your hip flexor (final illustration). Stay here and then when you are ready return to Sivansan. There may be an extraordinary difference at this point between the right hip and the left hip, also the right leg and the left leg may feel unrelated as well. This will be brought into balance once you have done both sides. When you are ready draw your left knee into your chest and begin the same sequence on the left. Keep the right leg long and relaxed throughout. I wish everyone a free-flowing pelvis and a good life.